Democrats, meanwhile, are launching an investigation into the president’s proposal. President Donald Trump on Monday signaled he was eager to move forward with a plan to bus undocumented immigrants to so-called sanctuary cities — prompting a battle with Democrats that could easily scuttle any nascent congressional movement on the issue. “Those Illegal Immigrants who can no longer be legally held (Congress must fix the laws and loopholes) will be, subject to Homeland Security, given to Sanctuary Cities and States!” the president declared in a tweet on Monday. If Trump moves forward, he’s certain to face backlash from the Democratic House and potentially from his own party. Already a group of House chairmen are launching an investigation into the White House’s consideration of the proposal to transfer undocumented immigrants detained at the border into cities that have limited their cooperation with federal immigration agencies. “Not only does the administration lack the legal authority to transfer detainees in this manner, it is shocking that the president and senior administration officials are even considering manipulating release decisions for purely political reasons,” wrote House Homeland Security Chairman Bennie Thompson, Judiciary Chairman Jerry Nadler and Oversight Chairman Elijah Cummings. The three Democrats demanded documents about DHS’ development of such a plan, whose existence has been denied by Trump administration officials but confirmed by the president himself. Republicans have largely shied away from endorsing the plan so far. The lone GOP senator in the Capitol on Monday, Dan Sullivan of Alaska, declined to comment on the idea. However, Sen. Kevin Cramer (R-N.D.) gave Trump’s plan a boost on Monday. Cramer won his 2018 election over Democratic Sen. Heidi Heitkamp in part due to Trump’s campaigning on restrictionist immigration policies. “Given the administration’s limited options, releasing these immigrants into sanctuary cities may make the most sense until Congress is willing to change our immigration system,” Cramer said. Some Republicans hope to use Democratic alarm over Trump mulling such a plan to at least force the two parties to find a solution on immigration. 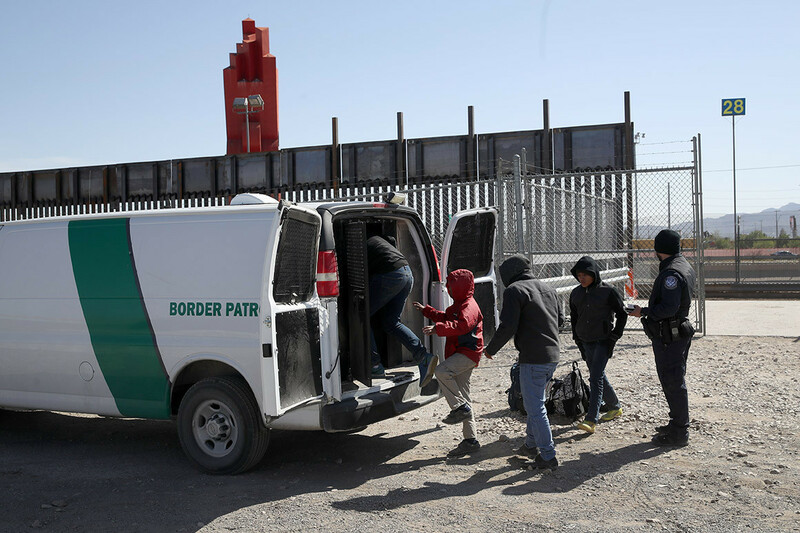 Sen. Lindsey Graham (R-S.C.) said Sunday on Fox News that he is working on legislation that would change asylum laws to dissuade Central American migrants from coming the southern border. Senate Majority Leader Mitch McConnell (R-Ky.) said last week he wanted Congress to enter a bipartisan immigration debate, but the issue has bedeviled Washington for years despite calls in both parties to change a broken system. Democrats are not eager to engage with the president on immigration given how often bipartisan talks have fallen apart. Trump is in campaign mode already as are more than a dozen Democratic White House hopefuls, meaning there will be little impetus for either party to compromise in the near term. So Trump may try to force the debate himself by moving forward with his migrant relocation notion. The White House and DHS denied the idea was ever seriously under consideration, but the president revived the idea just a day later, saying in a tweet that he was “strongly considering” the idea. On Friday, Trump blamed a court settlement known as the Flores agreement that bars the U.S. from detaining migrant children for more than 20 days and has framed his proposal as calling the bluff of leaders in sanctuary cities. Over the weekend, he asserted he has the “absolute legal right” to move forward with his plan. White House press secretary Sarah Huckabee Sanders confirmed Sunday the administration was “looking to see if there are options that make” Trump’s proposal legally viable and described it as “an option on the table” among other immigration enforcement measures. She argued that sanctuary cities that say their arms are open to immigrants will help ease the burden of communities along the border swamped by a surge in migrants. Democratic lawmakers and leaders of sanctuary cities quickly responded to Trump’s plan over the weekend, decrying the White House’s use of migrants as “pawns” and its deployment of demonizing rhetoric, occasionally calling the idea a waste of resources but largely affirming they would welcome the immigrants. The proposal comes amid a major leadership shake-up at DHS as Trump considers an extensive immigration crackdown. In the span of a few days last week, Trump pulled the nomination of his pick to lead Immigration and Customs Enforcement, DHS Secretary Kirstjen Nielsen and Deputy Secretary Claire Grady resigned, and the head of the Secret Service left the administration. Stephen Miller, an adviser to Trump and an immigration hard-liner, has pushed for more extensive changes at the agency and an even larger clamp-down on immigration. In that time, Trump has also threatened to close the U.S.-Mexico border, an idea he later backed away from after widespread backlash over the potential economic effects. He has also reportedly sought to reinstate his administration’s controversial family separation policy, though he denied doing so. His administration has also considered targeting countries whose citizens most frequently overstay their visas in the U.S.